Being one of the poor city dwellers with no backyard, no lawn, not even a patch of green grass close to my place (parks included), every summer, when grills light up across the country I reach a point of utmost despair. There is nothing I like more than to grill. Yet, with our rooftop off-limits and our fire escape off-limits, I get a tiny bit of precious grill time only when our suburban friends invite us to their garden parties. Even then, my grill time is typically reduced to 15 minutes at the end of the event, when everyone is stuffed and the guys who protect the flames have had about enough. They wonder away to play soccer, and leave me to play with leftover meat. Hence, when it gets to the art of grilling, I am in no-man’s-land. I still have a long way to go. But I did master the art of grill forgery. And I do it very well! Come summer, my broiler is in full swing, catching up with its grill cousins across the country. To compensate for all the heat and smoke, our air-conditioning is in full swing, too, and so is our electricity bill. But the end product is to die for and it is all that matters—as long as no one gets to see the Con Ed statement. If you are using chunky preserves, process in a blender until smooth. In a small saucepan over medium heat, warm the preserves, stirring occasionally, until it becomes liquid. Add the vinegar, soy sauce, Sriracha, pepper flakes and butter, and whisk until all of the ingredients are fully incorporated and the mixture is smooth. Remove from the heat. Season the wings on both sides with salt. Brush the wings with half of the glaze (reserve the other half), and place under the broiler (not too close to the broiler, otherwise the wings will burn). Broil the wings for about 20 to 25 minutes, turning occasionally, until the skin is crisp and juices run clear. 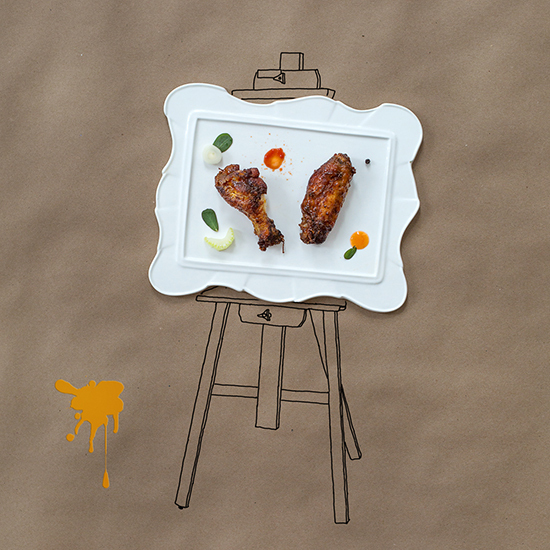 Brush the wings with the remaining glaze and broil for another 5 minutes, turning once. Remove the wings from the oven, let them rest for about 10 minutes and serve. 25 Best Chicken Wings in the U.S.